Dinosaurs are certainly some of the most iconic animals to have ever walked the earth. For centuries this large group of reptiles has captured peoples’ imaginations, in both the public and academic realms alike. One of the most enduring ideas about dinosaurs that anybody has ever had is a system of classification that was first put forward by the naturalist Harry Seeley in 1887. Seeley’s big idea was that all dinosaurs could be grouped in to either one of two distinct subgroups i.e. they are either ornithischian (with a ‘bird-like’ pelvis) or they are saurischian (with a ‘lizard-like’ pelvis). This scheme has been, to this day, almost universally accepted as the correct model of dinosaur interrelationships. But how well tested is this rather simple hypothesis? Is there any evidence to be found that might support alternative patterns of relationship among the early dinosaurs? And where do the most recent early dinosaur discoveries fit in to this scheme? – These are the questions that I started to ask myself while I was working towards getting my PhD. For me at least, this really started in a hotel foyer in the south of Berlin. The insights that I had gained during my first year of PhD research, as well as from the various talks and posters at the conference that I was attending, had led me to start obsessing on one particular question – could our idea about the fundamental shape of the dinosaur family tree be wrong? I chatted to a colleague about it briefly while we waited for a group who were still lingering in the hotel bar. It became obvious that I wasn’t the only one to have wondered such things. Maybe there is something to this I thought. I arrived back in the UK from that meeting full of new energy and set about adjusting my research topic to one that would address, in a fresh and objective way, the questions of how the earliest dinosaurs may relate to one another and whether or not Seeley’s insight could be supported (or refuted) using modern analytical techniques. One of my supervisors, Prof. Paul M. Barrett (one of my co-authors), had already been pushing me to broaden the scope of my thesis to be about dinosaurs more generally and this seemed like an obvious way to achieve that. My other supervisor, Dr David B. Norman (my other co-author), when I approached him, seemed very pleased that I had finally found the track that he had always envisioned me taking. A wry smile appeared on his face when I talked about my observations; the penny had dropped. To analyse the possible interrelationships of the major dinosaurian groups in a systematic way, I was required to build a large (the largest to date in fact) novel dataset of early dinosaurs. My supervisors and I compiled a list of Triassic and Early Jurassic specimens that could be of potential interest and then set about finding ways to see them first hand. I also assembled a large library of papers on the earliest known dinosaurs and made a list of anatomical features that I felt might be useful for discriminating between and uniting the various species in my sample. With my anatomical character list made, I then embarked on a series of long trips, visiting collections in the UK, North and South America and South Africa, the latter being the place that I was also able to conduct some field work, collecting material from the Early Jurassic rocks of the Free State, ZA. After my travels were complete I began the long task of building my matrix, which is a spreadsheet-style document in which each dinosaur species can be ‘scored’ for the anatomical characters that it does and does not possess, using mainly 0s, 1s and ?s. Our dataset took the best part of three years to complete, all things taken in to account, and in the end included 75 early dinosaurs (and close dinosaur relatives), pulled from every continent on earth, including Antarctica. Our taxa ranged in geological age, body-size, in terms of their diet, in terms of their method of locomotion, in terms of their completeness, and are housed in over 30 different collections worldwide. It was a very long and gruelling task. 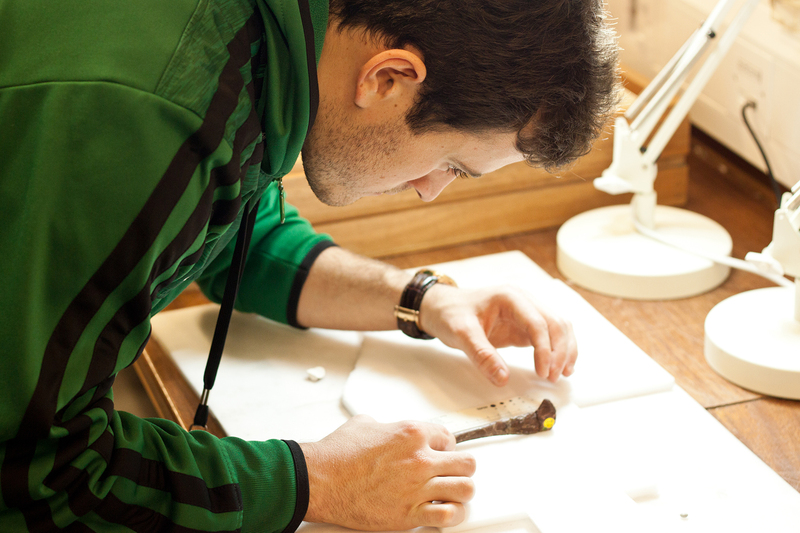 Our first analyses, on the other hand, were carried out in less than 10 minutes - the beauty of modern computing power. Old vs. New: A summation of previous hypotheses, with the position of the enigmatic Herrerasauridae causing a fair bit of debate (left) and our new hypothesis (right). The former appears in every kids book on dinosaurs, every museum display and every undergraduate geology Paleo101 course handout; the latter might need to be substituted in if our hypothesis gains acceptance among vertebrate palaeontologists. When we first got a result, with the three major lineages within Dinosauria being arranged in a completely different way to how they have ever been before, I was excited but, admittedly, cautious. This would be extremely controversial if we published it. So my co-authors and I then spent the best part of a month playing around with the computer program and the matrix, trying to find out how much support there was for this radical alternative hypothesis. Once we were convinced that our result was indeed a fair reflection of what the anatomy of our sampled taxa was telling us, we were then faced with a dilemma: What is a dinosaur? Traditionally dinosaurs were defined as the least inclusive group that that included the house sparrow (lest we forget that all birds are dinosaurs) and Triceratops. Unfortunately, in our new hypothesis, this group would not actually include the long-necked tree browsers (sauropodomorphs) such as Diplodocus and Brontosaurus. Not fancying being run out of town by a mob of disgruntled sauropod workers at the next big annual conference, we opted to change the definition of dinosaur to guarantee that Diplodocus and co. will forever remain within the dinosaur group, whether our hypothesis is ultimately accepted or not. I think that we made the right choice. So, what to call our ‘new’ group... Our novel result included a clade of theropods (meat-eaters) and ornithischians (things like Stegosaurus) and this clade didn’t have a name. We suspected that someone, a long time ago, may have suggested a similar grouping scheme, back when dinosaur research was still in its infancy, and so we scoured the literature searching for any possible clues of what may have already been suggested. We were pleasantly surprised to discover that a similar grouping had once been proposed by another British naturalist, Thomas Henry Huxley (Darwin’s Bulldog and inventor of the word agnostic to boot). In 1870 Huxley had suggested grouping together a number of ornithischians and theropods, excluding sauropods and their kin; he named this group Ornithoscelida (“bird-limbed”). Sadly, this name fell out of favour after Seeley’s work was published and it has been largely forgotten about ever since. Curiously, the one place that it has survived is in the word Ornithoscelidaphobia, which is the name for a fear of dinosaurs! Would you believe that? 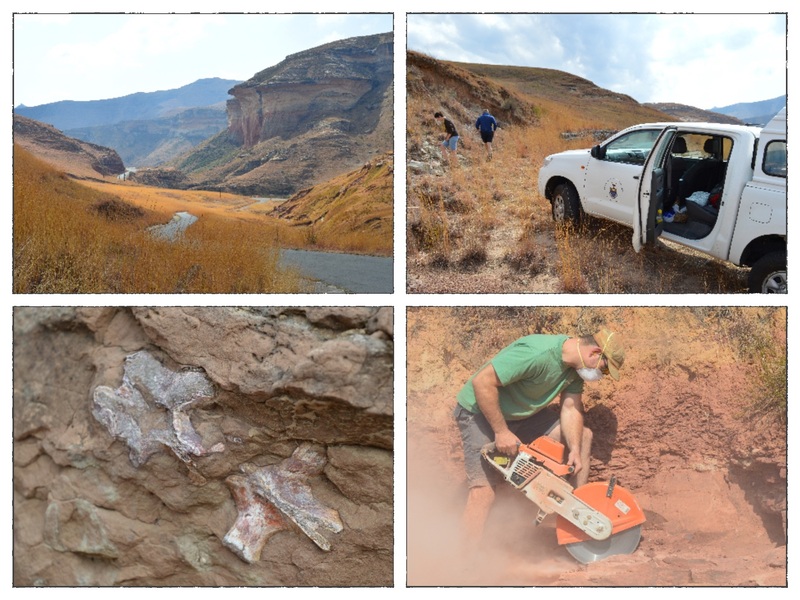 Snaps from our field work in the Free State Province of South Africa: Searching for dinosaurs of the Early Jurassic with Paul Barrett, Jonah Choiniere (pictured) and a gang of my fellow research students. With this new tree topology tested to the point of exhaustion, and with new, more stable definitions given for Dinosauria and a number of other dinosaurian clades, we then had to reassess what this all must mean for our overall understanding of the dinosaur's origin and evolution. While there is going to be a lot of debate about our finds, one thing is for sure, no future discussions of dinosaur evolution can ignore what we have suggested in our paper. Perhaps Ornithoscelida will be back for good; perhaps not. Either way, many important question about early dinosaurs that have previously gone unanswered may find new solutions within our new evolutionary framework and there still remains a lot of work to be done. One example is the origin of feathers, which, if they are truly present in ornithischians (as some fossil finds suggest), may hint at the fact that modern birds get their plumage from their ornithoscelidan ancestor. Given Huxley’s determination to show the world that birds descended from dinosaurs, what could be a more fitting way to kick-start a renewed interest in the topic than a revival of one of Huxley’s long forgotten dinosaur clades?